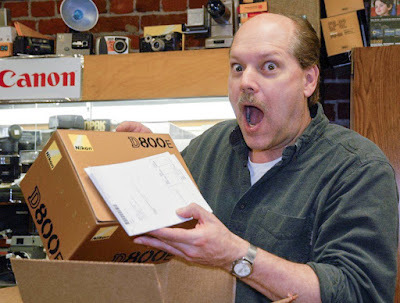 Here is Steve just moments ago at Leo’s Camera receiving MY new D800E. I know he’ll play with it before he ships it to me, but that’s okay. I’ll have the D800 and D800E in my hot little hands tomorrow. Right Steve? I’ve laid out the criteria for my testing. The set-up: I’ve decided to use my 70-200mm 2.8 Nikon VR lens for most of the tests. I may use the 200-400mm f4 Nikon VR as well. I chose these lenses as they mount directly to the tripod. I can change cameras without changing lens position or focus. All exposure readings will be made with the D800. The D800E will be set to match. I have several locations staked out including cows in Carson Valley as a substitute for wildlife fur. Birds as I can find for potential feather moire’. I will also do a quick test of video between the two for moire’ problems. I’ll be making prints of the images as well as posting results. Hopefully by Monday.